RIGHT ON YOUR MOBILE DEVICE! Convenient & Smart Enough For You To Expect It! YOU CAN GET IT FREE! First, Get BOSTON LOCAL. Either head over to your device's Apple or Android eStore and search for THE BOSTON DIRECTORY or BOSTON LOCAL App or, even easier, simply scan the QR Code located below in the page footer. Regardless of device, scanning this QR Code will automatically take you to the proper installation/download source for your mobile device. Once you have successfully installed or downloaded BOSTON LOCAL, select either eCoupons or QR-Qpons tabs to view all available local eCoupons. You also find all available Boston local coupon circulars in the 'eCirculars' tab. You've been so busy all week long that you just haven't had the time to get yourself together for tomorrow's event. Your long commute home has you thinking about all the shopping prep work that lies ahead of you. "Hey... is my local salon or barbershop having a discount tomorrow?" "Gotta go there anyway; what about a coupon for the new clothes I'm going to need?" "Nails, shoes, gift?" Wouldn't moments like this present great opportunities to do some on-the-spot shopping... Boston local shopping? Right now... even while you're listening to your music, why not just whip out your smartphone or tablet and check out THE BOSTON DIRECTORY. Just open your BOSTON LOCAL App or Mobile Website and start searching for eCoupons and deals. WHO KNOWS, you may just end up finalizing all of your purchase decisions even before you arrive at your station or stop. Real Easy! It doesn't get any easier. THE BOSTON DIRECTORY places all BOSTON LOCAL eCoupons conveniently within a single tab location. You no longer have to tediously search through stacks or pages of newspapers, magazines and mailers. They're always with you; always available 24x7 right on your mobile device. Whether pre-planning your shopping during your commute, up late or working overnight, or right as you're stepping through the merchant's door, your BOSTON LOCAL eCoupons are instantly and conveniently available to you right where your are. They're super easy to find whenever you want them, need them or desire to share or social-share with others. Pre-sorted first by Boston local neighborhood then alphabetically within each neighborhood makes for an efficient way for you to search, shop and support the City of Boston local neighborhood where you live or work. Since THE BOSTON DIRECTORY makes it very easy, convenient and extremely affordable for even the smallest Boston local merchant to effectively market their business and to distribute eCoupons, whether 1 or 1001, you're likely to find more eCoupons from an increasing number of Boston local neighborhood merchants and their eCoupon offers added daily. For you, that means greater opportunities to Shop Local-Buy Local while taking full advantage of local neighborhood savings. Have you noticed all of the coupons that are being stuffed into your mailbox EVERY SINGLE WEEK? Do you still clip coupons? Do you even have the time or desire these days to sit and search through this seemingly perpetual 'paper mountain'? All BOSTON LOCAL eCoupons are always conveniently available to you. NO MORE 'paper mountains'. NO MORE coupon clipping. NO MORE lost savings simply because you don't 'clip'. With BOSTON LOCAL, eCoupons are always there with you... Right On 'Your Mobile Device! Have you also noticed the number of Boston local neighborhood merchant coupons among these 'paper mountains'? (Hint: Typically None!) 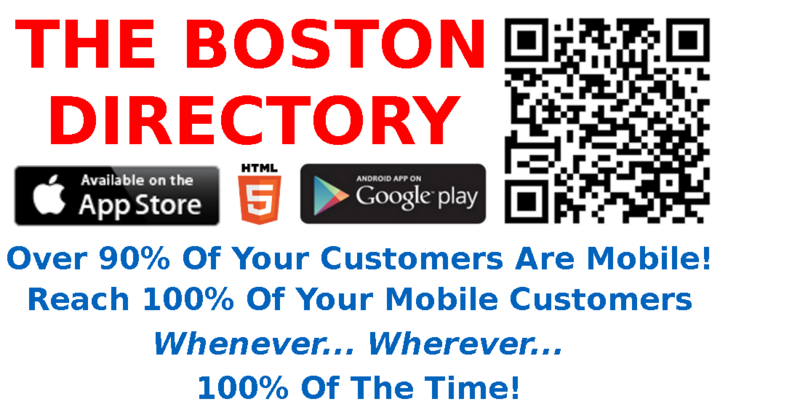 THE BOSTON DIRECTORY makes it super easy, efficient and extremely cost-effective for even the smallest Boston local business to begin delivering coupons right to your mobile device. Whether you 'clip' the coupons to want to use or simply save the circulars (the entire circulars), isn't it strange that even though you have every intention of using them, neither the coupons or circulars are ever around when you actually need them? Because you are virtually never without your mobile device, all BOSTON LOCAL eCoupons are virtually always with you and at your fingertips all day, every day whenever you want them, need them or desire to share or social-share them with others. SHOP LOCAL-BUY LOCAL throughout your City of Boston local neighborhood and SAVE CASH... conveniently! Simply display the home-screen of BOSTON LOCAL, THE BOSTON DIRECTORY App or Mobile Website, right from your mobile device. SERIOUSLY, can it get any EASIER? RIGHT ON THE SPOT, you whip out your smartphone or tablet and open the BOSTON LOCAL App or Mobile Website. WHOA! Just like that, you found a 25%-Off "This Day Only" eCoupon. YOU FLASH... YOU SAVE CASH!